Oh heck. Here he goes again, you say! Another five stars? Yes. Bloody, yes. Stop sneering and pay attention. The Secret In Their Eyes is a fantastic thriller with substantial heart. It’s as exciting as it is emotional, and has an assured delivery in every respect. In tone, I find it might be closest to glossy stuff like State of Play, but really, they are miles apart. I can’t recommend it highly enough, but I’ll try my damndest! Settle in, this might take a while. The key to its success is the terrific playful dialogue which is consistent and relaxed even while the plot mercilessly fluctuates in tone. You will frequently laugh out loud, even at mere banter or during a rather serious moment, but never underestimate this films heart. It simply crackles like old fashioned Hollywood with a modern, naturalistic edge and is performed beautifully by the superb cast. Ricardo Darin as Esposito and Soledad Villamil as his boss Irene are particularly brilliant and charming, essentially playing dual roles, as it is essential they convince as both young and idealistic, and as the older, regretful versions too. Argentinian comedian Guillermo Francella plays Esposito’s drunken partner Sandoval, but don’t assume he is a thin slapstick backup. He plays a character as layered as any other. If you excuse my ignorance, I suppose he might be a Spanish Robin Williams. And what of the man who brings all this together? This is the first film by director Juan José Campanella I have seen and I think he does an incredible job. The film has a complicated tone, but he makes it so smooth and as I said earlier, the screenplay has absurd moments that he nevertheless embraces enthusiastically and he bolsters others with ingenuity that never feels forced or manipulative. There’s an astonishing five minute unbroken scene in a football stadium that will make your jaw drop, but he knows when to step back too. The awful early flashback moment when Esposito first encounters the crime scene is a similarly long take, yet a sombre one. The Secret In Their Eyes is a magnificent achievement and highly deserving of its Best Foreign Language Academy Award, although that feels like a back-handed compliment. It is after all an also-ran category in a very English language, Hollywood dominated ceremony. Thank goodness Hurt Locker won the main award, because I think if this and other acclaimed world cinema like Lebanon had to stand in Avatar’s bright blue shadow, the Academy would have lost all credibility. I heard about this film before; I think it was Kermode who gave it a rather positive review as well. Seems like something I might like, actually. Oh heck. Here he goes again, you say! Another five stars? Yes. Bloody, yes. Stop sneering and pay attention. You caught me there. I know you like thrillers, but this seems too much like Campanella inflated one of his Law & Order SVU episodes into a movie. 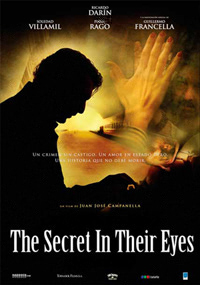 The Secret In Their Eyes is a magnificent achievement and highly deserving of its Best Foreign Language Academy Award, although that feels like a back-handed compliment. Unfortunately, I still haven't seen any of those nominees. It won against Audiard's Un prophète and Haneke's Das weiße Band, both of which are higher on my to-do list. I think you would, Achim. It's basically very entertaining, yet the characters feel real and not caricatures. Certainly both you and Mr Cynical here should try it! That's a shame. I did tell you to pay attention! I would have thought I'd made it clear how the elements of the case itself are sidelined by the drama. It's like they recognised the inherent absurdity of such stories and in a way, I felt it was like The Constant Gardener, except that did take it's plot more seriously, but at least in so far as how the central character is affected and how that is considered more important than how the plot concludes. Look at this way. In a typical thriller, including episodes of TV series, the viewer is drawn into the particulars of the case and who did it. Usually there is a twist, and then an exciting conclusion where the villain gets his comeuppance or, if they're trying to be ironic, he gets away and it becomes all profound and stuff. The Secret In Their Eyes might feature a crime being investigated, but you know who did it very early on and he gets dealt with as a matter of routine by about the halfway mark. There is more to it by the end, but it is not what this film is about. In fact, I was willing it out of the way so it could get back to the central pair! Esposito comes to realise something about his own life by simply seeing how the grieving husband comes to terms with losing his young wife. I did also talk at length about the dialogue. It's not fair to dismiss this as a mere extended TV episode, especially without seeing it, when the writing is as sharp as this. I have A Phrophet, but haven't seen it yet. My gut tells me what to expect from it and even if it's a work of genius, it will have a hard time against this. It catches you in the most unexpected ways and many elements could have gotten away with only being half as good. That's something I always appreciate, when something is better than it needed to be. I was initially interested in The White Ribbon, but there seems to have been an overwhelming backlash against it and I'm finding more of a ring of truth in the poor reviews than I am in the good ones. It's crashed down the must-see list for me. Rotten Tomatoes is always a rough barometer. Really nothing in it: they have A Prophet at 97%/87%; Secret 91%/92%; but White Ribbon 85%/75%. I just watched this movie. Jon I'm sorry but once again I have to disagree with you. Your 5 out of 5 rating is wrong. Bless you, sir! Glad you liked it. I tell everyone about this film and most ignore me, as usual. It really is a good movie, tell everyone that this guy in Canada says they should listen to you for once. The fun thing is I don't even know how/where/why I got it, I just happened to have it in my unwatched pile...................well actually that movie was my unwatched pile. I decided it's time to watch it, not expecting much but thinking if it was bad it wouldn't have a gotten an Oscar. And then bangg......................surprise..........I'm hit with a very good movie. I love when this happens. I can't remember the last time I did that with a DVD, but it is great when it happens... The sad thing is, this one seems to be rapidly going out of print in the UK. I told my cousin about it a few months ago and then bought it her for Christmas. It took ages (relatively) to track it down. Glad I did though. Turns out she had listened to me before, loved it and couldn't get a copy for herself, so she was made up with her pressie! Did you watch a dubbed version Jon ? I watched it with sub-titles, the one I have only has Spanish. No, mine was subtitled. I don't like dubbed, so just as well. I have it in my unwatched pile (it was in my player last week but I took it out agin before hitting Play ) as well. I remember for a fact that I purchases it based on Jon's review. It made it into your player and then you took it out again? Leave it in! You'll love it.